This year, more than any other year, I have learned it is not great snow that makes for an awesome ski season, but a stoked attitude. So often I've heard this was the worst winter ever. I've read there is no snow. But here is the weird thing – for Elaine and I – it's been our best winter ever. From early November powder at Caribou, to night skis on the Asnes with torches on Christmas Eve, to amazing powder in February, to adventures across the divide and back, to skate skiing, to the Power of Four and the Elk Mountain Traverse, to today…hopping dirt patches at Eldora while the lifts were closed because of lightning…the smiles and stoke are always there. 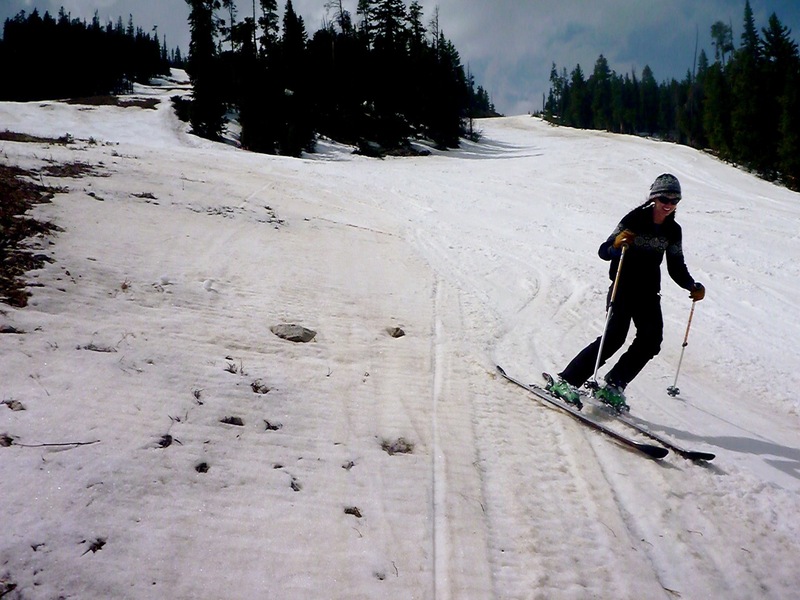 Sure, we dream about deeper snow and bigger mountains, but that's not what skiing is about. It's about your adventure, the stoke of your crew and making the most with what you've been given. It's about the simple and beautifully efficient act of a plank sliding on snow, and taking you along for the ride, in flight and effortlessly. It gets better. Two feet of snow predicted this weekend. Persistence, rewarded by the snow gods.